Are you looking for a best Ubuntu Music player to listen to your favourite music while working on the Linux operating system, then there are dozens of Linux music payers. You just need to find out the right one for your taste. Although Ubuntu already comes with the music app to play songs and other audio files, however, you can install an additional one to get more features and experience. To help you with this, we have created this list of top Linux music player those work on both Ubuntu and Linux Mint. Apart from these two other Debian or Ubuntu based Linux such as Elementary OS can also be used to install these Linux Music players. If you like any of them then you can also see the installation article of that particular music player on Ubuntu, the link has given with each of them. So, without further delay let’s see the Top & Best free plus open-source Linux Mint and Ubuntu Music player. 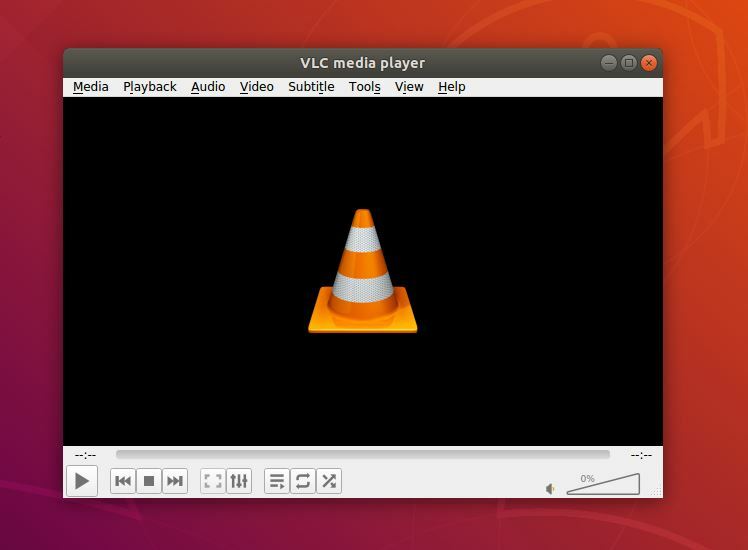 Whatever people say but the VLC Media Player is one of the best all purposes opensource Media player that supports both Music/Audio files including a quite large number of Video file formats. If you just want the best music player along with a capability of video playing without any complicated interface then don’t struggle with multiple players the VLC is one for you. The best part is that it is a cross-platform media player available for Linux, Windows, Mac, iOS, and Android. 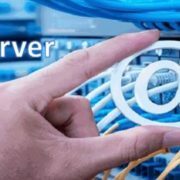 It supports hardware decoding on most of the platform that allows to it use the power of your installed graphics to play the high bit rate audio files and ultra-resolution videos smoothly. It has the ability to stream video and audio over the network, just you need to enter the URL of the server in the player from where you want to stream the content. The user can customize the VLC player look by using the hundred of the skins available on the VLC’s official website, moreover, if you have coding knowledge then you can create your own. Link to download VLC media player. 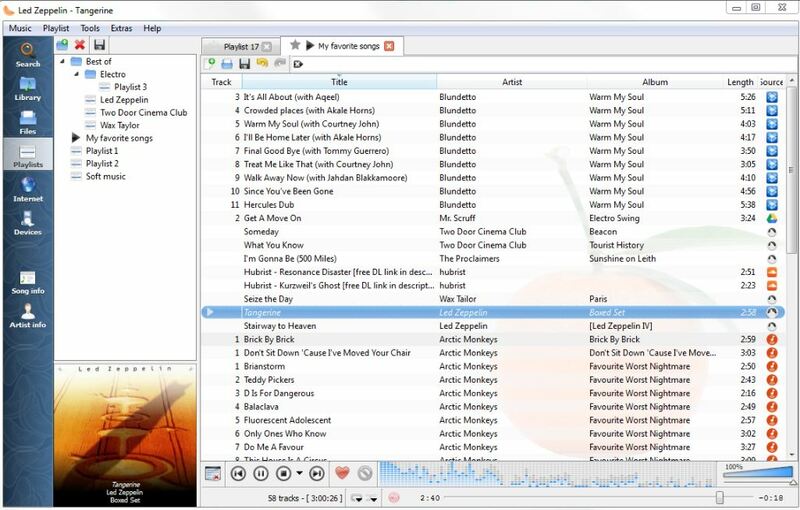 The Clementine is the popular choice of the Linux user those want a dedicated free and open source music player. It is a cross-platform music player inspired by other Linux Music player Amarok 1.4. Having cross-platform support, it is available for Linux, Windows, and Mac OX. The Clementine is written in QT and offers a tree structure navigation to easily go through the music list. It supports internet radio from the popular channel or sources such as Soundcloud, Spotify, Grooveshark, SKY.fm, Digitally Imported, JAZZRADIO.com, Icecast, SomaFM, Magnatune, Jamendo, and Subsonic servers. In the world of the cloud, we have GBs of free space over the cloud storage services like Box, Dropbox, Google Drive, and OneDrive. And if you want to use them for music then just upload your music file over there and use the Clementine from anywhere to stream them via the internet. Furthermore, it supports visualizations from projectM, Lyrics, and artist biographies and photos; Fetch missing tags from MusicBrainz; Copy music to your iPod, iPhone, MTP or mass-storage USB player; Discover and download Podcasts, even the missing album cover art from Last.fm and Amazon. 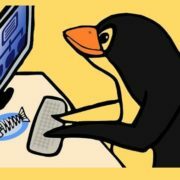 Another great feature is the Remote Control, it offers an app called Clementine Remote that lets you control your installed “Clementine” on Ubuntu or any other OS remotely. Website Link to download Clementine Ubuntu music player. The above given Clementine music player for Ubuntu Linux is inspired by this beautiful looking KDE’s default music player called Amarok. It is also open source and free to use. The Amarok was started losing its popularity for some time but with recent updates, the developers have fixed lots of bugs and again present it as a strong contender in the world of open source music players. It has really a nice interface with different colour skin options to set the mood of the user. If you are looking for Ubuntu music player then this one can be your because of its capabilities of supporting tons of audio formats, ability to search for lyrics and artist via integrated Wikipedia search, you can run in on Linux, Mac OS X, and Windows; built-in equalizer and a large set of plugins. The latest version of Amarok can connect to various Web services such as Last.fm, Magnatune, The Echo Nest, MP3tunes, Jamendo Service, Ampache, and OPML Podcast Directory Librivox. 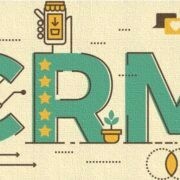 It features Dynamic Playlists, Scripts Context View, Multiple Language Translations over 45, PopUp Dropper, Cross-Platform support, Collection Management, Database Importing, Integration of other web services into Amarok, Bookmarking, File Tracking, Audio CDs ripping and more. See: How to install the Amarok Music Player on Ubuntu. 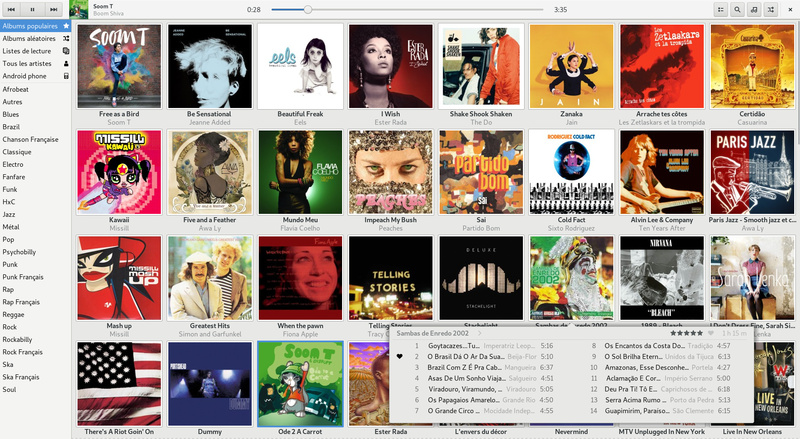 Lollypop music player is the GNOME-based player with a modern interface like iTunes. 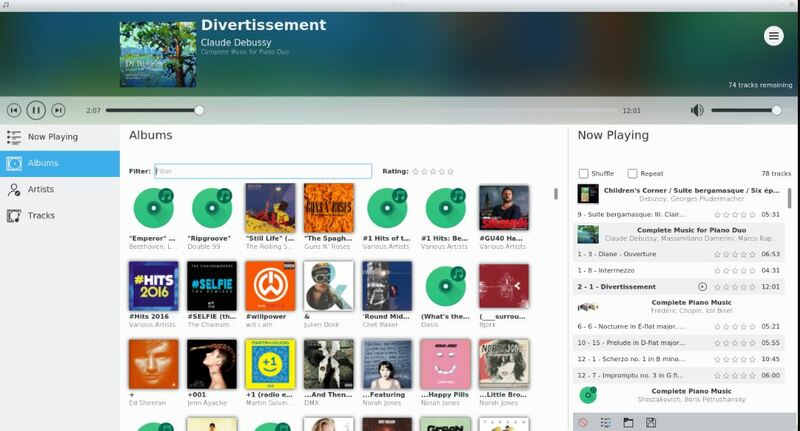 It is also free and opensource music player with a very interactive interface. Lollypop is based on Python/GTK+. It supports a variety of music file formats and also one can browse them by album cover, artists and music genre. Lollypop features metadata support to automatically fetch the lyrics, artist bio, and cover art; ability to sync with Android via MTP; support Last.fm and TuneIn radio services, Audio scrobbling, and Music streaming. It also has the party mode which automatically starts playing the party related playlist; HiDPI display support. Download Lollypop for Ubuntu: Link to website. Rhythmbox is another GNOME-based music player for Ubuntu. 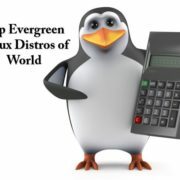 It is a very popular Linux music player and widely used too. It has a straightforward and easy to use interface. It uses the GTK based and uses the Gstreamer as a media framework. So, it means the Rhythmbox supports all those formats supported by the GStreamer including the plugin system. 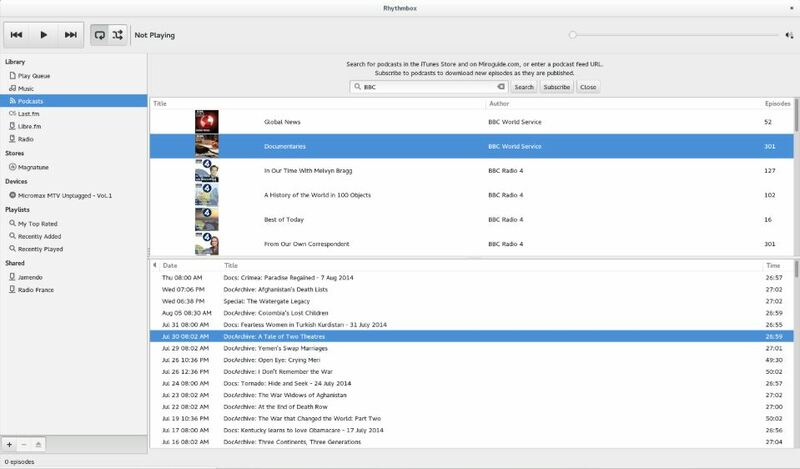 Rhythmbox features audio scrobble, support to Last.fm, Soundcloud, Web remote control (by the plugin) Jamedo support and more. If your requirement is a simple, snappy and single interface music player with light system requirements then the Qmmp is the one. You can consider the Qmmp as Winamp music player with basic music controls and minimal interface with the playlist window. The best part is as like Windows Winamp you can also use a variety of themes to customize the Qmmp look and feel to make it a part of your style. Apart as Ubuntu music player, the Qmmp supports platforms ALT Linux, Arch Linux, Debian GNU/Linux, Fedora, FreeBSD, Gentoo Linux, Mageia, PCLinuxOS, openSUSE, RedHat, Slackware, and Windows. 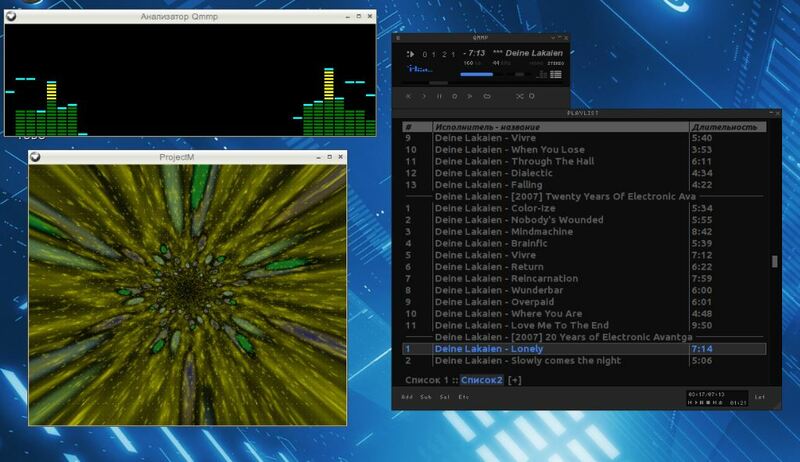 I couldn’t consider the Elisa as the best music player for Ubuntu because it is still in the developing stage. I included it here because of its interface and simple and easy to use features. 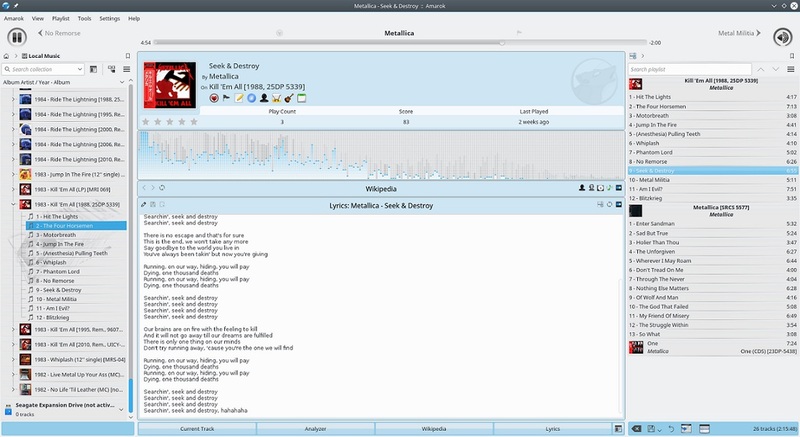 The Elisa can be used as Ubuntu music player developed by the KDE community and a flexible product with a good Plasma Desktop integration capabilities. Simple and modern looking Music player developed by the Deepin team. The Deepin music player also known as DMusic is the default music player of the one the beautiful looking Ubuntu-based operating system known as Deepin. It is developed by Chinese developers. It has a simple interface with a list of all music and few controls at the bottom along with an option to see the lyrics of the song. Other music players those exist for Ubuntu are Banshee Music player (link), Cmus Command line based music player; Audacious, Tomahawk, DeaDBeef, Spotify. So, these are some Ubuntu music players and if you think you know any much better then please let us know, the comment section is all yours! !